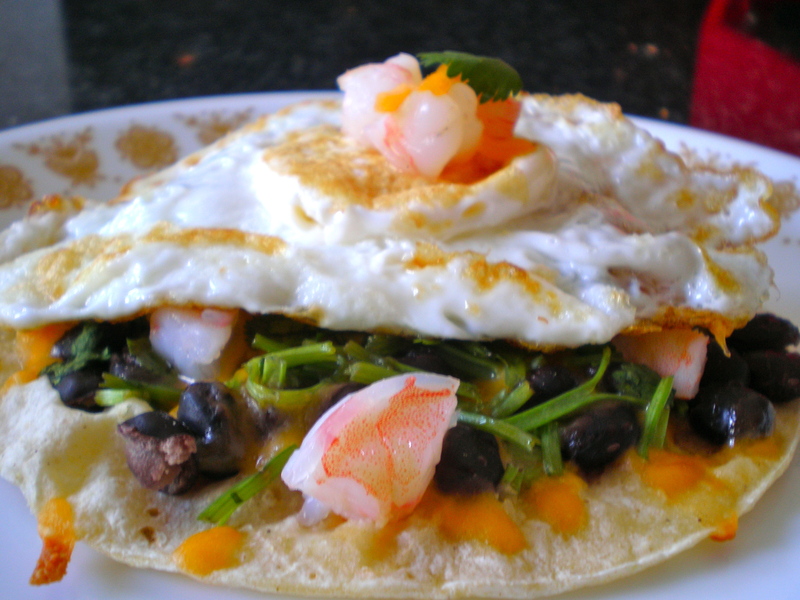 Tostada – [tɒˈstɑːdə] – A flat tortilla with various fillings piled on it. I’ve said it before and I’ll say it again. I love savory breakfasts. I will almost always choose a grilled cheese egg sandwich over a bowl of cheerios. I attribute my penchant for savory eats to the breakfasts of my childhood. Growing up, dad cooked mini “gourmet” breakfasts for my sister and I on Saturday mornings. Oh they were simply scrumptious. Once such dish included sauteed matchstick carrots, garlic fried rice, a sunny side up egg and tapa, thin slices of marinated sirloin steak – Filipino style. Since then, I’ve always been on the lookout for creative savory breakfast dishes that are both simple and fun. Coincidentally, many of the recipes I have conjured up are a mix of ingredients that are ready and available in my pantry. Why? You know how sometimes you have left-over ingredients from last night’s dinner recipe? And you’re not quite sure how to use ’em without making the same thing twice? But you also don’t want to let it go to waste? 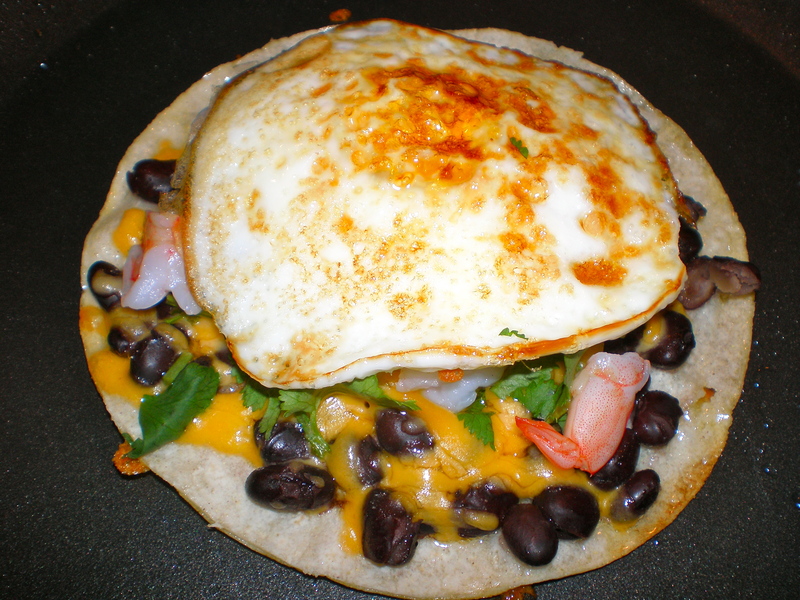 That’s when ideas start flying and it is how this tostada recipe came about, one Saturday morning. Fill a pot of water enough to cover the shrimp and place on medium heat. When it gets to the point where it is just above a simmer (not boiling! 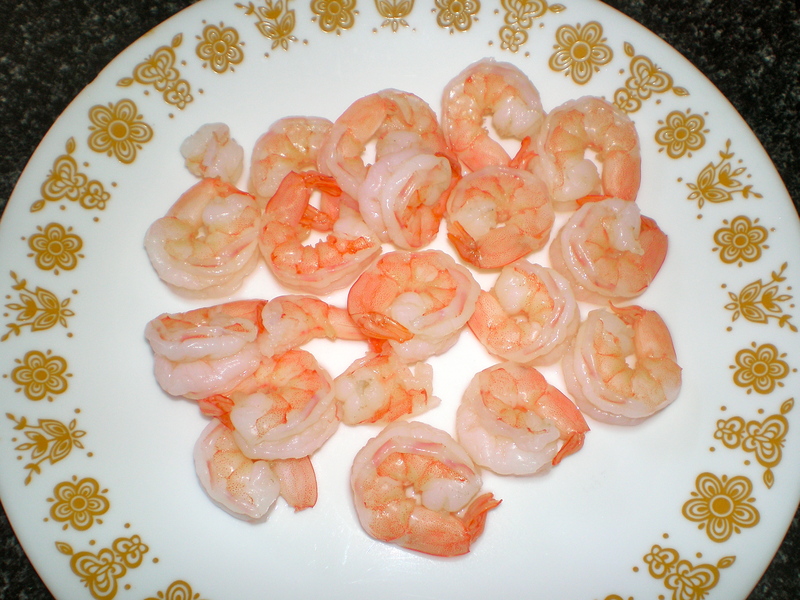 ), slide in the shrimp and mix it around for about 3 minutes then pull them out and set aside on a plate. In my case, take a picture and set it aside. Heh. Step 2. In a non-stick frying pan, pour about 1 tbsp of oil in the pan on medium heat and swirl it around the pan. 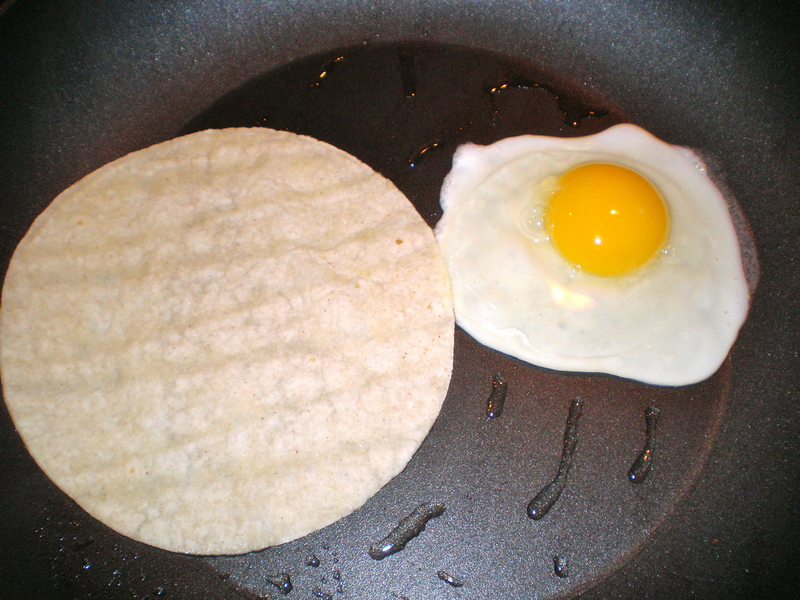 When hot, break an egg on one side and place the tortilla on the other side. You can definitely cook the two separately but my pan is big enough to fit both, so why not? Step 3. 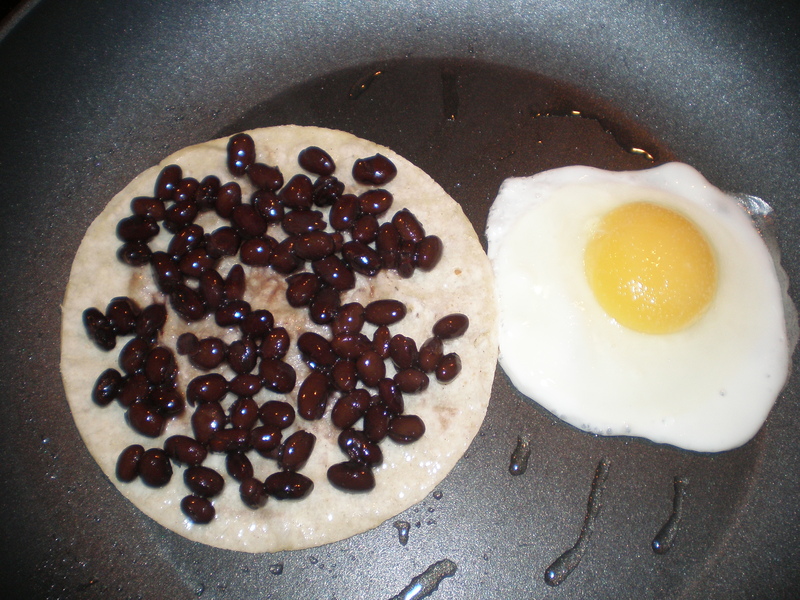 Distribute the beans on top of the tortilla. Don’t forget to drain the juices! 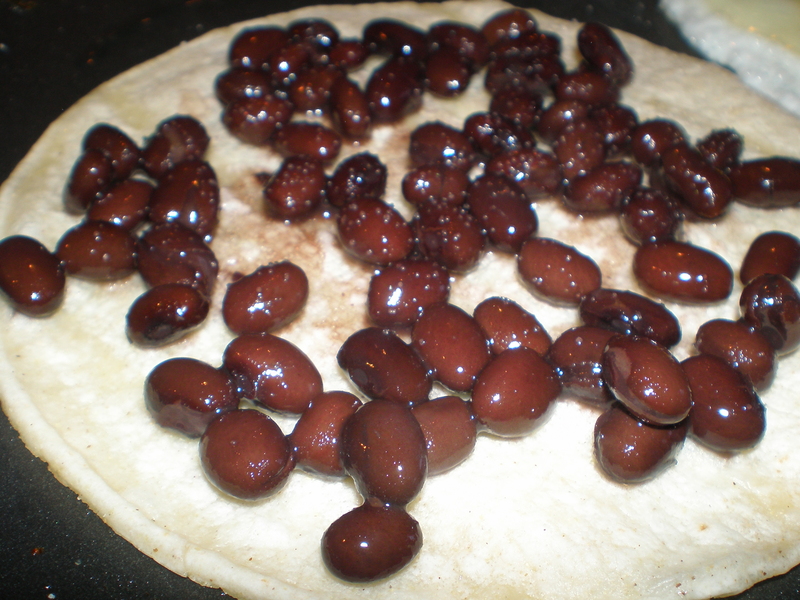 Bean juice = soggy tortilla = not so texturally appealing. We want crunch here!! Mm I love sunshine eggs. Especially when it gets crispy & brown on the edges. Step 4. Season the beans with a little salt and pepper. As far as I know, canned beans don’t come seasoned and are for the most part, boring, without it. Salt your egg, too. Step 5. 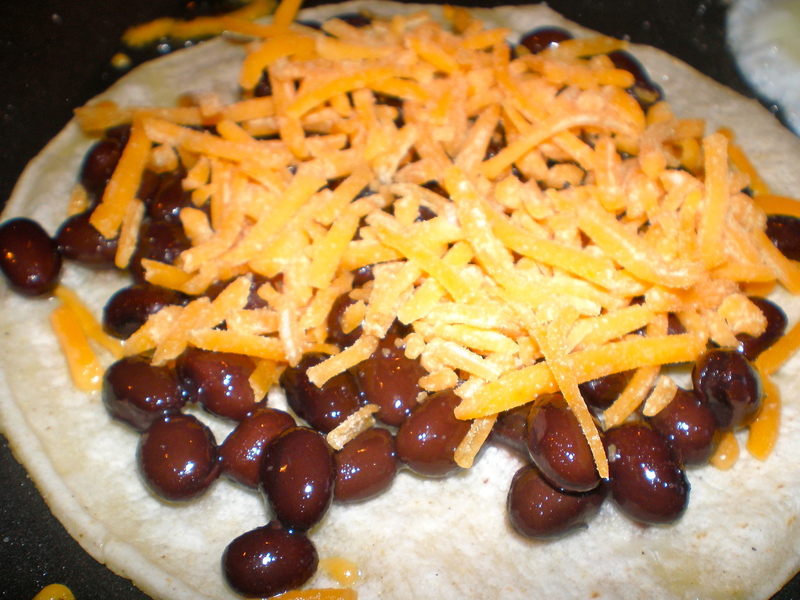 Add the cheese on top of the beans. Ok, so I know this totally does not look like 3 tablespoons of cheese. I got a little heavy handed ok? I won’t judge you if you do the same. At this point, I flipped the egg over but you can choose to leave it as is if you like your eggs over easy. For this recipe, I prefer the yolk a little solid. Step 6. Nip off a few cilantro leaves, give them a quick rinse and place on top of the tortilla. Cilantro is one of those things you either hate or love. I know someone who likens eating this herb to eating shampoo. Personally, I could eat a heaping bunch of it – yes, insane, I know. Spring rolls, tacos, tostadas – these were totally created for the sake of cilantro in my mind. If these greens don’t appeal to your palate, fresh baby spinach will do or you can get rid of the veggies all together. Step 7. Chop the cooked shrimp in thirds and scatter randomly. Or, if you’re like me, add them strategically so that every bite gets a piece of goodness. Then lick your lips when you notice the cheese has started to melt nicely. Step 8. When the egg is done, place on top of the shrimp. Step back and adore your mini tostada creation. Step 9. 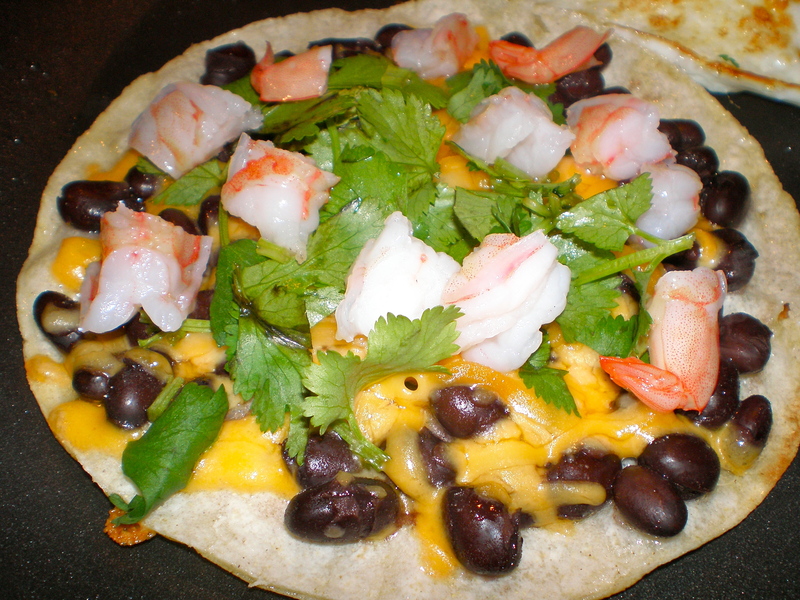 Garnish with a little bit of cheese, shrimp and cilantro. Enjoy! From start to finish, one tostada takes about 15 minutes to accomplish – 10 if you’ve done it more than once and you’ve got everything pre-prepped. The thing I like about this recipe is its versatility. Shrimp can be substituted with leftover steak or chicken from the night before and you can use whatever cheese you have on hand. Once, I substituted beans for 3-pepper and garlic roasted hummus and I used avocado instead of cilantro. The possibilities are endless! I like having options when I cook. Get creative, you might just surprise yourself ! There’s a sense of accomplishment in taking what you have at hand, using it in a completely different way and in the end surprising yourself with something delicious. Here’s to exploring new ideas and to savory breakfasts! Jedd, this looks absolutely delish! 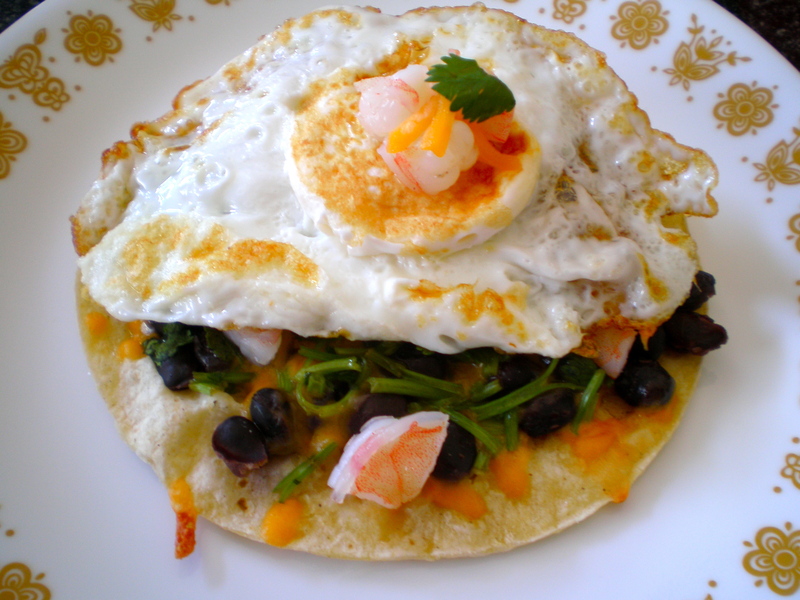 It’s funny – my dad makes “mini gourmet” breakfasts on Sat mornings too. 🙂 This is probably why I love breakfast foods so much!